Let’s become proficient in how to integrate LinkedIn in your iOS application. 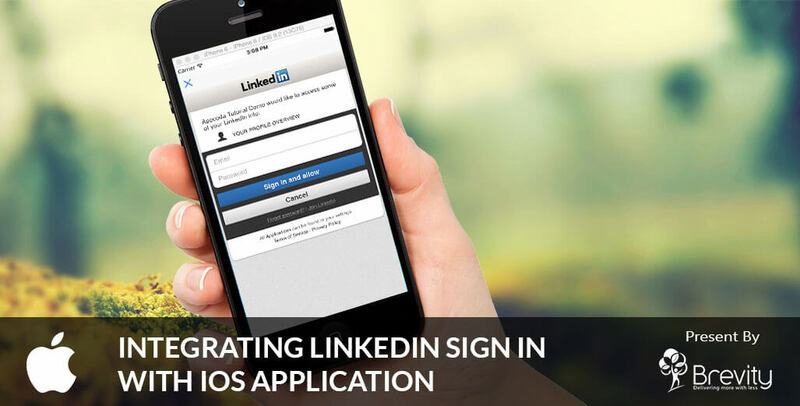 Note: This blog is about how to integrate LinkedIn Login in your iOS app with LinkedIn REST API. You can also integrate with LinkedIn Mobile SDK for that check the link below. Fill all the details to create new application. All fields are mandatory. After filling all the detail click on submit button. You can find ClienID and ClientSecret from there. Also you can update application permissions and Authorized Redirect URLs. r_basicprofile is by default checked, if you want to fetch email then also check r_emailaddress. Then we have to provide Authorized Redirect URL inside OAuth 2.0 section. It is needed when a user tries to refresh an existing access token. The user does not require to log in again if he has already login previously, the OAuth flow will automatically redirect the app using that URL. For normal login process that URL is exchanged between the client App and the server while fetching Authorization code and access token. The authorization URL should not real or existing URL. You can provide any value starting with “https://”. Don’t forget to click update button after changing all information. Step:2 Create XCode project name it “LILoginDemo”. In your viewController add labels for firstName, lastName, email, Id, public url, if you want to display other details then also add labels for them. Add 2 buttons Login Using LinkedIn and Get Profile Details. Add another view controller and add webview inside it. Add a WebViewController.swift file assign it to another view controller in storyboard. Give segue from Login Using LinkedIn button to other view controller. In your WebViewController class add constants for linkedInKey, linkedInSecret, authorizationEndPoint and accessTokenEndPoint. Assign value of Client Id to linkedInKey and value of Client Secret to linkedInSecret. Assign https://www.linkedin.com/uas/oauth2/authorization to authorizationEndPoint whick is used for request. Assign https://www.linkedin.com/uas/oauth2/accessToken to accessTokenEndPoint which is used to get accessToken. Our main goal in this step is to prepare the request for getting the authorization code, and to load it through a web view. redirect_uri: The authorized redirection URL value that you have specified while creating application in LinkedIn Developer’s website. state: A unique string required to prevent a cross-site request forgery (CSRF). scope: A URL-encoded list of the permissions that our app requests. Now create a method in WebViewController with name startAuthorization(). Inside this method specify request parameters as shown in below code snippet. // Set the redirect URL which you have specify at time of creating application in LinkedIn Developer’s website. Adding the percent escape characthers is necessary. let scope = "r_basicprofile, r_emailaddress"
Next step is to compose the authorization URL. For that use URL assigned to authorizationEndPoint, and append all parameters. Finally we have to load the request in webview. Make sure that you have passed correct parameters otherwise you are not able to login. To load request in webview you just need to write couple of lines in startAuthorization() method. We have to check in webview delegate method that the request URL is the one we are looking for and also we must ensure that the authorization code exist in linkedIn response. Then get authorization code by separating string and call requestForAccessToken(authorizationCode: String) method and pass authorization code as parameter. Inside requestForAccessToken(authorizationCode: String) method, request for access token using NSMutableURLRequest. Specify grant type and redirect url and set all POST parameters. Set parameters to request body, set HTTPMethod to POST, set content type = application/x-www-form-urlencoded to HTTPHeaderField, After all setting send request. You will receive access token in response, store it in NSUserDefault and dismiss view controller. Full code snippet for requestForAccessToken(authorizationCode: String) method given below. Now in your ViewController.swift file check for Existance of access token and if it already exist then no need to ask user to login, so disable Login with LinkedIn Button and enable Get Profile Button. On Get Profile Details button tap request for user profile detail. For that you we have to make GET request to the linkedIn server by using access token asking for user’s profile detail. Here id, public-profile-url, first-name, last-name, email-address are parameters name. If you want more detail then you can pass respecting parameter. You can find list of parameters here (https://developer.linkedin.com/docs/fields/basic-profile). After getting success in REST API response then get all detail from dictionary and display it in specific label. Create application in LinkedIn Developer. Set authorization redirect URL and default application permission. Prepare request to get authorization code and load it in webview. Get Access Token using authorization code and store it in user default. Using Access token get user profile info.